After two years in office, the de Blasio administration has made bold moves to make the Internet accessible for all New Yorkers. As the gears of federal government have ground to a halt, a new energy has been rocking the foundations of our urban centers. From Atlanta to Seattle and points in between, cities have begun seizing the initiative, transforming themselves into laboratories for progressive innovation. Income inequality, affordable housing, climate change, sustainable development, public health, participatory government—cities are tackling them all, bringing new urgency to some of the most vital questions of the day. Welcome to the age of big city progressivism! Cities Rising is The Nation’s contribution to the conversation. December 2013 was electric. Many of us who toiled in the trenches of racial justice and anti-poverty policy were tremulous with possibility. 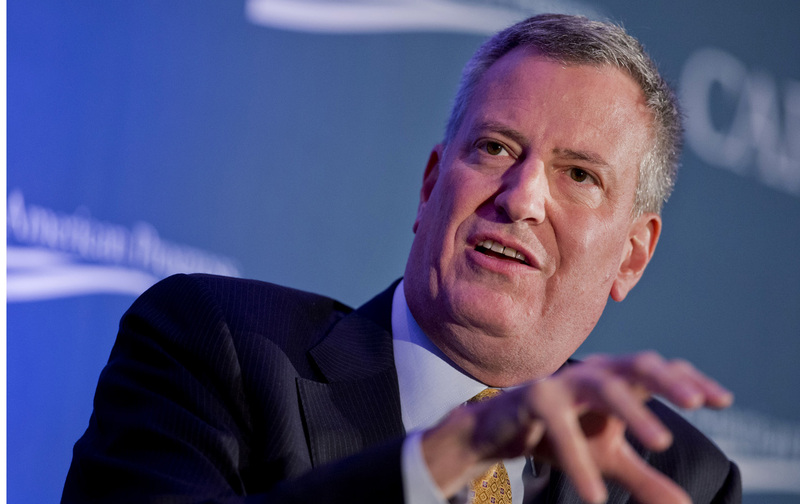 Bill de Blasio was soon to be inaugurated mayor of New York City—the first Democrat to take that oath of office since David N. Dinkins in 1990. His mandate to end the tale of two cities—one rich, one poor—was big, bold, and unflinchingly progressive. And for people of color, particularly black New Yorkers, Dante’s dad (as some of us had begun calling de Blasio after his Afro-wearing son appeared in a star-turning primary ad) represented a leader who understood the Gordian knot of race and income inequality. There is no off-roading to solve income inequality for people of color. They must have broadband. For policy wonks like me, it was a time to tell our newly minted mayor what the solutions were. I did what we all did: fingertips to keyboard. I pounded out an opinion piece for The Nation suggesting that the largest, most diverse, and disturbingly segregated city in America would not turn course sufficiently without community-scale broadband strategies. I had no idea when my article ran on January 8, 2014, that the mayor would summon me to his office soon after, offer me a position as his counsel and then assign me the challenge of creating and moving his broadband strategy. Two years later, I am proud to say New York has made bold moves to increase broadband access. Few would debate that the information superhighway is both an on-ramp and HOV lane for the global economy. Whether a resident needs to get online to access homework or supplemental educational tools, to search for a job or start a business, broadband is a necessity. Most may not realize how many can’t afford it. Jillian Maldonado, a South Bronx single mom who was earning $300 a week as an Avon representative is an all-too-familiar victim of the digital divide. After a long day, she would come home, make her young son dinner, and then take him past the check-cashing store, a small grocery, and the occasional drug dealer to get to the library to get him online to do his homework. A family that doesn’t know how it will make its monthly rent payment may not have $75 a month for in-home broadband, let alone a computer. More than a third of low-income New Yorkers still do not have broadband at home. It’s why this year, for the first time in the history of the city, we added a broadband category to the capital budget and pledged $70 million over the next 10 years towards free or low-cost wireless service for low-income communities. These investments are part of the mayor’s aggressive approach to expanding broadband access. There is no off-roading to solve income inequality for people of color. They must have broadband. And the solutions for neighborhoods where most residents struggle to make ends meet require accountability and fair play by large telecommunications firms. Mayor de Blasio has been unflinching in his demand that firms like Verizon and those trying to enter the New York market, like Charter and Altice (which has entered into a deal to buy Cablevision that will require City approval), play by the rules, be transparent, and demonstrate that they will contribute to the public interest, not solely their own. Verizon, in particular, which is under contractual obligation with the City to bring high-speed fiber-optic service to all New York households that want it, is key to ensuring more competition. But the large incumbent firms tend to lack business models that make services available to those who can’t pay for their broadband packages. Bringing costs down substantially requires many more market entrants than we currently have in New York. We can work on that. In the meantime, looking to community solutions, like the Red Hook Initiative, has been mission-critical. The Red Hook Initiative, which I wrote about in my article for The Nation two years ago, created outdoor free wireless access to the Internet, with local residents trained to install the network, and fostered residents’ ability to come together to solve community problems. We started small and with what we had available. In 2014, we used some existing funds to wire for broadband the seven New York City Housing Authority (NYCHA) computer centers that didn’t have it. We added mobile broadband vans that can travel to public housing developments for online access. We negotiated a first-of-its-kind franchise to turn our payphones into free, superfast, wireless hotspots in all five boroughs over the next decade, with the first kiosks going up now. And we are in the process of developing free broadband for more than 16,000 public housing residents in Queens, Brooklyn, and the Bronx, as well as partnering with President Obama and Housing and Urban Development Secretary Julián Castro to accelerate broadband adoption in NYCHA developments. We won’t stop there. We are committed to keeping the Internet open and free, and we are now advocating for the federal government to make subsidies for low-income household telephone service available for broadband too, so that our residents can pay for service more easily. We have more to do to help Jillian Maldonado and her son. But two years after we started, with the help of an undaunted mayor who gave us an aggressive goal and his full support, we are working hard to contribute to a more democratic Internet and to one city, rising together. Maya WileyMaya Wiley is Counsel to New York City Mayor Bill de Blasio. In addition to advising the Mayor on legal matters, she spearheads special projects, such as expanding affordable broadband access across all five boroughs, jobs for all New Yorkers and civil and human rights and gender equity.